When I was five years old, I walked to the liquor store. The one a block and a half away from my apartment. The one my mom used to go to, to exchange food stamps for real money so she could make the rent. The one where the nice Chaldean man would let my mom buy eggs and milk on credit. I walked like a kid planning to buy candy. When I got there, I went right up to the counter, “Can I do something to help you around the store,” I said. “You can pay me with milk, or bread, or eggs.” He smiled and said, “Oh sweetie, you are too young to work,” and I left without candy or a job. Purpose is our reason for living; for being who and where we are. I didn’t know it then, but from the time I was little, my purpose was to provide and nurture. This is my first memory of that. I am forty now, and this purpose seems more clear to me than ever. In listening to my heart and paying close attention to my heart’s yearnings, I have come to understand that I am the most fulfilled and happy when I serve in this capacity. 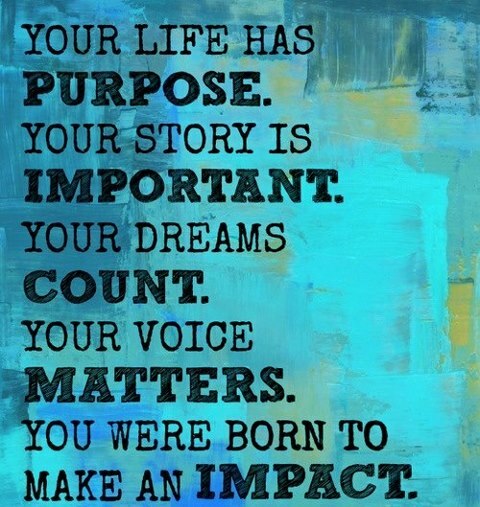 As I look back on my life, I can see that through every action and decision, I was trying to fulfill my purpose. Like when I used to commute on the city bus with my grandmother on the weekends to go to my mother’s house and clean, wash clothes for my four brothers and cook food for the week. My mother worked all the time and had little time to focus on her home. Even though I was in Jr. High, there was something about being able to help my grandmother and mother that evoked a feeling of joy and fulfillment in me. This is the same reason I so enthusiastically awaited the birth of my daughter when I was eighteen. Not having any concrete future goals, subconsciously, I knew that I could fulfill my purpose through becoming a mother. In retrospect, this is also what drew me to teaching and mentoring youth. Knowing this about myself helps me to discern what I want to do next in my life. Regardless of what specific role I serve in, my purpose to nurture and provide must always be the most important criterion in my decisions. Nurturing one’s purpose is also an important aspect of strengthening one’s connection to it. If we don’t allow ourselves to be an expression of our purpose, it doesn’t die, but it withers, wrapping itself like dead vines around our hearts. We have many roles that we undertake in our lives. Some roles like being a mother, a daughter, or a wife may be permanent in our lives, though they tend to adapt and transform according to circumstance. Other roles, like those we serve in at our jobs or in our communities may change many times in our lifetime. This is why it is important to determine what our purpose is so we can be intentional about employing every role in pursuit of that end. When we see our roles in the context of our purpose, we can have a greater vision for ourselves and the meaning we make of our lives. Our dreams become clearer as our actions align with our purpose, and those dreams drive our calling. It is in this space that we are able to transform ourselves and the world. This is what is meant when it is said that we all have a role to play in creating a better world. Learning not to confuse my role with my purpose is a lesson I have to revisit often, because it is the only way to live my life authentically with some amount of confidence in my journey and peace in my heart. I focus on my purpose for doing things rather than the position I hold, and this challenges me to critically question whether a role or opportunity will allow me to be the greatest expression of my purpose. Thus, I learn what to welcome in my life and what to say no to. With the intimate knowing of my purpose also comes the fulfillment of the greater purpose of life. To embrace life, the good, the bad, and the uncertain; the way the tree embraces the sunlight, the darkness, the wind and the rain. I am here to love, to learn, to give, to laugh, to cry, to yearn, to be!